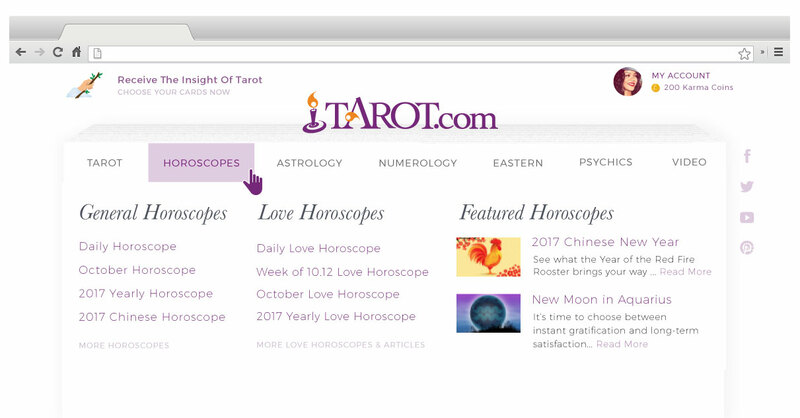 Tarot.com Is Getting a Makeover! It's been a few weeks now and we're excited to announce the final release of our re-styled desktop navigation. Please let us know your thoughts in the comments below as we continue to improve your experience! We look forward to hearing from you and your feedback on these exciting changes. Our Desktop Navigation is All New! Just as we promised, we’re rolling out another wave of changes to Tarot.com! We are excited to present our users a more simplified and functional desktop navigation. Included with this update, are not only our most popular pages but also our latest news, recommended products and most recent articles. Check out the before and after photos below and let us know what you think in the comments at the bottom of the page. If you've been using our site for a while, you may have noticed that things are beginning to look a little different around here! 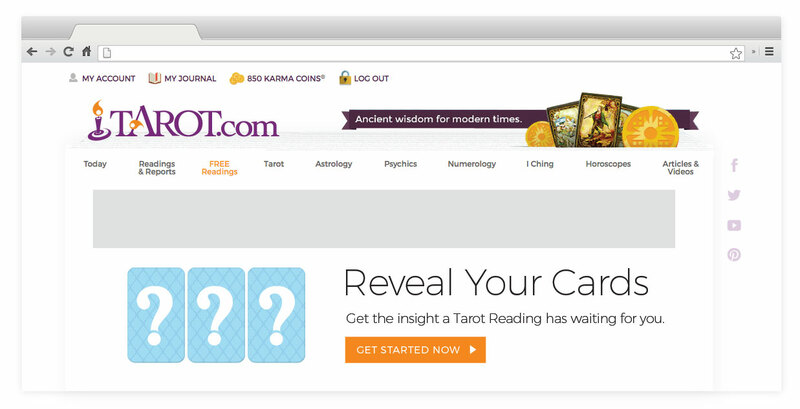 We're always listening to our Tarot.com community, and thinking about ways to make your experience here better, faster, and easier. That's why we freshened the place up a bit, and although it may look a bit different for those of you browsing our site on a desktop computer, the same stuff you have come to love and depend on is still here. We promise! Does it look a little cleaner around here, or is it just us? We've removed our old blue patterned background to give our site a more fresh, modern appearance. Now nothing will distract you from getting the insight you need! 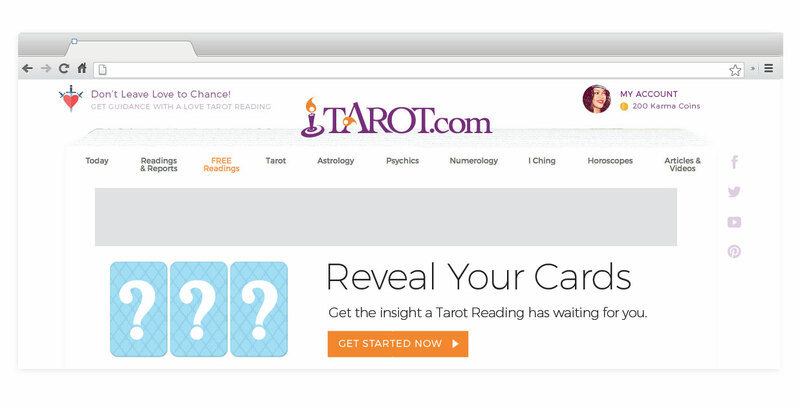 The Tarot cards that used to sit prominently at the top of our site have been replaced with your account information. We'll always love Tarot and its cards -- we are Tarot.com after all -- but we switched things up to make it easier to find what you need. 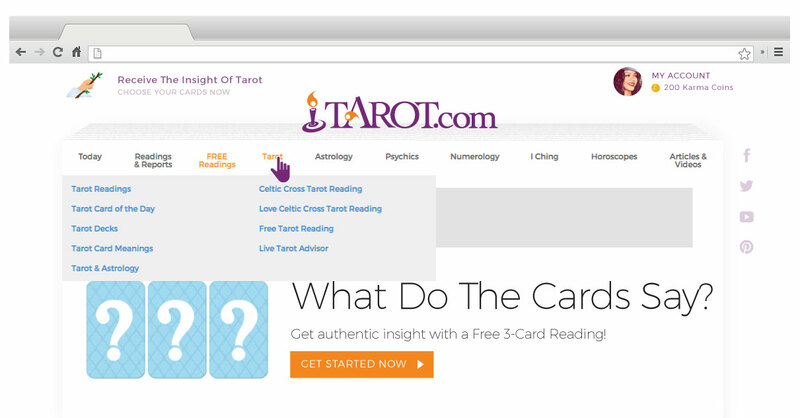 We know many of you used this feature to get our free readings, but don't worry, we aren't taking them away! You can still get them here. And if you're a huge fan of the Tarot cards themselves, you can view a wide variety of them here. Your account information used to be spread out along the top of the site, but now it's in an easy drop-down menu so you can find whatever you need in one area. In this one section you'll be able to log in and out, bring up your general account information, view your journal where readings and reports are stored, change your account settings, get your Karma Coin balance, and purchase more Karma Coins. You can also get your Karma Coin balance any time in your member profile, or directly through this link. If you use the reading analyzer, you'll have access to it through your journal. For those of you who used multiple profiles when running readings or reports, the "My Other Profiles" section can be found directly in your reports, or here. We wanted to have a way to let you know about things on our site that we think you'd like. We're using the area to the left of the Tarot.com logo to tell you about things like free readings, new readings, sales, and other things we think are pretty great. Stay tuned for more exciting changes to come in the coming weeks -- we hope you're as excited about these changes as we are! We'd love to know what you think about them so let us know in the comments below.